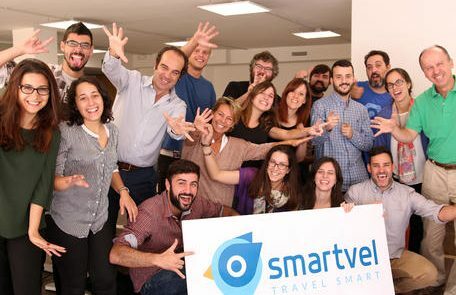 Smartvel, a Spanish startup provider of updated destination content solutions for the tourism sector, has closed its second round of investment worth more than 1 million dollars, which will allow the tech company to continue its fast growing path. In addition to the support of Caixa Capital Risc and Alsa that invested in earlier phases and have increased their participation in this round, the deal has involved reputed investors in the business world such as Fides Capital, Faraday Venture Partners or Pinama Inverstartups. First level international investors such as Max Burger, as well as other independent investors have also participated. “The most valuable thing in this round is the relevance of the investors. All of them with successful backgrounds in the consolidation of companies that have been able to change the dynamics of many industries. We are confident that thanks to them we can become a benchmark in content solutions in the tourism sector nationally and internationally” says Íñigo Valenzuela, CEO of Smartvel. “At Smartvel, we want to help the main companies within the sector to improve their traveller’s experience, by providing value through content solutions that allow users to get inspiration and plan a trip in an intuitive way” Valenzuela assures. Spanish medical device innovator Nuubo has received United States Food and Drug Administration (FDA) 510(k) clearance to market in the US its Nuubo System, a disruptive wireless, textile-based ambulatory electrocardiogram (aECG) technology that enables mid and long-term monitoring for cardiac arrhythmia diagnosis. The Nuubo System is designed to obtain the highest ECG signal quality while achieving best-in class patient comfort for monitoring up to 30 days. The non-invasive device consists of a seamless wearable fabric with multi-lead sensor technology that is flexible and stretchable. The Nuubo System is simple to use and has no adhesives or wires, improving patient comfort while increasing patient compliance and arrhythmia diagnostic yield. team for this achievement, I also want to thank the Nuubo board members and investors for their continued support,” said Alcántara. Fides Capital participates in the last round of financing of Valencia-based interactive video marketing platform PlayFilm for a total amount of €1.1 million in seed funding along with top business angels and VCs. The company envisages investing this capital to achieve a solid foundation of product/market fit and, as a result, transform PlayFilm into a leading SaaS video marketing platform. PlayFilm, one of Angels Capital’s (the investment arm of Mercadona’s founder Juan Roig) portfolio companies, has also received contributions from Spain’s top-tier C-level professionals, with renowned entrepreneurs such as Javier Rodríguez Zapatero (ex CEO of Google Spain), Marcos de Quinto (Vice President and CMO of Coca-Cola), Ángel Cano (ex CEO of BBVA), Toni Segarra and Luis Cuesta (Cofounders of SCPF) and Luis Bonell (ex CEO de Liberty Mutual International), appearing on the list. Besides Fides Capital, other professional investors include Sabadell Venture Capital, The Crowd Angel and Sevenzonic. Spanish startup Grupo Next has closed a new round of financing worth €1million with Fides Capital, the PMovil Group (Argentina / Brazil), Atresmedia, and Business Angels, led by Andres Echecopar, as participants. Grupo Next has developed a platform for connected cars (“smart cars”) that leverages data to monetize safety and maintenance needs related to the vehicle and its owner. Drivers can access geolocation and safety data, perform a complete, remote diagnosis of the car’s condition, and even receive timely offers for needs as they arise, such as refueling, battery replacement, and tire maintenance. Additionally, the platform provides in-car WiFi for up to five passengers. Spanish transportation startup JoinUp, founded by Elena Peyró and Alberto López, announced a follow-on increase of €430,000 euros to boost expansion of its corporate transport technology across Europe. Big Sur Ventures, Cabiedes & Partners, and Fides Capital are renewing their investment in the company. JoinUp, which had previously created a taxi sharing app, is at the forefront of the corporate transportation services sector with its focus on global mobility solutions for integrated travel management. Offering its innovative enterprise platform in more than 50 cities in Spain, the company has recently embarked on international expansion with support for new locations in France and Portugal.